Published on March 24, 2017 in Lake Winnipesaukee Hotel. Closed Tags: breakfast. Coffee and bagels have always made for a good pairing. This statement is particularly true if you are on vacation and looking to kick off a fun-filled day by the lake. As construction neared completion on the Center Harbor Inn, management looked to re-envision the continental breakfast offering. Too often a hotel’s continental breakfast is underwhelming and leaves a bad taste in your mouth. After much consideration, the team decided that the key to a positive continental breakfast experience was sourcing select, quality items from local vendors. Coffee is king and we wanted our guest to be happy with their early morning beverage. The inn partnered with Wayfarer Coffee Roasters to deliver the perfect cup of joe. A local roaster based out of nearby Laconia, Wayfarer struck a deal to supply a variety of freshly roasted beans and even came onsite to calibrate the handpicked grinders and train the staff. With the breakfast area just steps from check-in, any new guest will be greeted by a welcoming aroma of hand-roasted, freshly made coffee. The partnership also supplied homemade granola and signature energy balls to the breakfast counter at the inn. If you are looking for a power snack before a big hike, we highly recommend the energy balls. For some additional local flavor, the Inn struck a deal with Winnipesaukee Bay Gulls. This local bakery is widely known as the best bagel shop in the Lakes Region. Just a few minutes down the road from the hotel, Bay Gulls handmakes a variety of bagels and delivers them for the enjoyment of our guests. 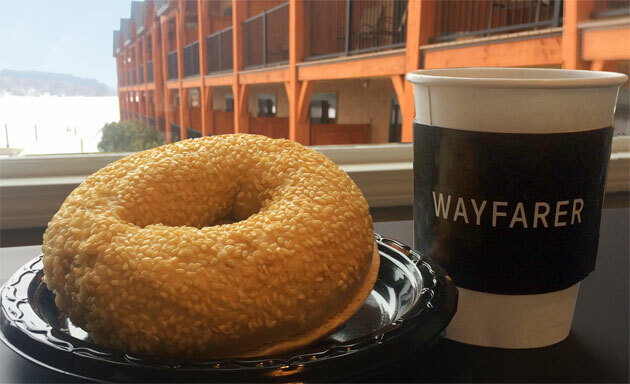 Imagine a delicious sesame bagel with a piping hot cup of locally crafted, dark roast coffee. Are we getting hungry yet? While the selection might be limited, the continental breakfast at the Center Harbor Inn packs in a few local staples that are sure to impress. Kick off your morning by tasting the local flavors and enjoying the sunrise on your deck. It’s hard to imagine a better start to your lakeside vacation.